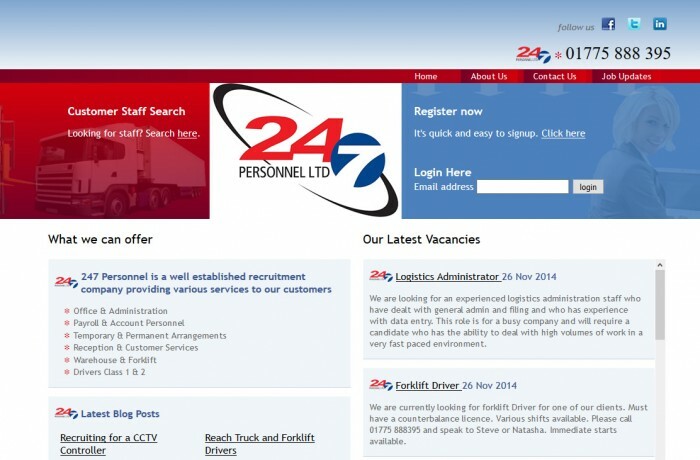 247 Recruitment from Spalding Lincolnshire were looking for an online jobs site where they could easily add new vacancies to their website, this was hand programmed in and also a blog was integrated into the site, when they add a new vacancy this would also add the job to Twitter, Facebook and Linkedin as well. Another feature of the website was the ability for people who were looking for work could sign up on the website and then upload their CV. Another section we built in was for companies looking for staff, they could sign up and be notified when a suitable job seeker was found, all in all a very successful website solution.